326 pages | 156 Color Illus. 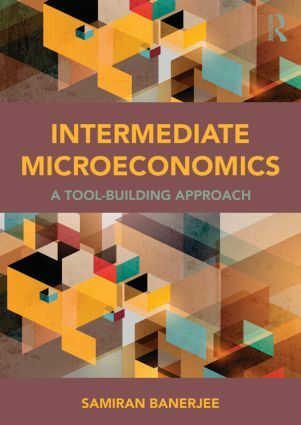 Intermediate Microeconomics: A Tool-Building Approach is a clear and concise, calculus-based exposition of current microeconomic theory essential for students pursuing degrees in Economics or Business. This beautifully-presented and accessible text covers all the essential topics that are typically required at the intermediate level, from consumer and producer theory to market structure (perfect competition, monopoly and oligopoly). Topics covered include risk, game theory, general equilibrium and externalities, asymmetric information, and public goods. Using numerical examples as well as sophisticated and carefully designed exercises, the book aims to teach microeconomic theory via a process of learning-by-doing. When there is a skill to be acquired, a list of steps outlining the procedure is provided, followed by an example to illustrate how this procedure is carried out. Once the procedure has been learned, students will be able to solve similar problems and be well on their way to mastering the skills needed for future study. Intermediate Microeconomics presents a tremendous amount of material in a concise way, without sacrificing rigor, clarity or exposition. Through use of this text, students will acquire both the analytical toolkit and theoretical foundations necessary in order to take upper-level courses in industrial organization, international trade, public finance and other field courses. Problem sets are available on WebAssign for instructors who wish to use them. These are located at http://www.webassign.net/features/textbooks/banerjeeecon1/details.html?l=publisher. Samiran Banerjee is Professor in the Department of Economics at Emory University in Atlanta, USA.